Perfect bedside alarm clock, which has cute animal shaped silicone shell, is especailly suitable for kid&apos;s rooms! 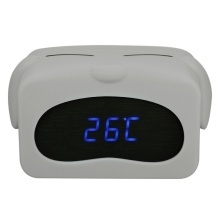 It displays time, date and temperature and provides 3 groups of alarms setting. Can be powered by DC 5V or batteries. Mini Cute Alarm Clock: imitation wood ABS body, wrapped by animal shaped silicone shell, espeically suitable for kids. Clear LED Display: blue LED light and big digital figure display provide you clear view. Two Display Modes: time(12H/24H)/date/temperature(°C/°F) display in turn OR only display time. 4 Levels of Luminance: 0~4 levels luminance adjustable according to your need. 3 Alarms Settings: it offers 3 alarms, and each alarm lasts for 1 minute. Sound Control: it will automatically turn off the display after about 10s when the function is on, easy to awake it by making some noise: knock desk, pat clock, etc. Two Power Supply Modes: powered by DC 5V or 4 * AAA batteries(not included).